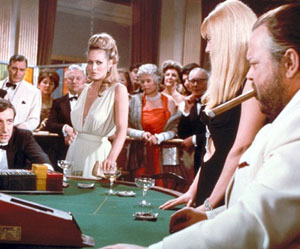 In North America, Australia, Finland, Sweden, and Macau, the version of Baccarat played is Punto Banco. This is also known as North American or Tableau. Punto Banco is a very high stakes game. In fact, in the US, Baccarat is played exclusively at high stakes, in private rooms. Only the real high rollers are invited, in a sense. This is the game that the very rich love to play. Wagers can often reach the hundreds of thousands of dollars on a single hand. The excitement of Baccarat lies less in the complexity of the game and more on the sheer stress of putting down such high wages. In most tables at traditional casinos, minimum bets start at $500. That said, there are many places that can have minimum wagers as low as $25. Online casinos, however have changed all this. It’s no longer a game exclusively designed for the extremely wealthy. Online casinos allow players on all sorts of budgets to find Baccarat tables to suit their budget. This opens up the doors to many players who have only heard of Baccarat in passing to experience this exclusive games for themselves. Of course, just because online casinos offer low stakes Baccarat, it does not mean that high rollers are denied their thrills. Online casinos have special Baccarat tables reserved to VIPs, which are available via invite only. Punto Banco, as I’ve mentioned before, allows players to place wagers on Player or Banker. Again, the Player bet is not reflexive—it does not denote the actual player. And the banker is not the croupier. These are abstract terms used in the game. When a hand starts, cards are dealt face down. The first card goes to the Player, the second card goes to the Banker then an additional two cards are dealt again one to the Player and another to the Banker. The croupier then turns over all the cards and reads out the sums of each hand. Simple so far. A number of rules determine what happens next. These are outlined by the “tableau”, which means table. If either hand sums up to 8 or 9 when the cards are turned over, then that’s the end of the hand. The higher value wins. These hands are called “natural”. If this, however, is not the case, then the rules that govern the game take over. The rules are divided into “Player’s Rule” and “Banker’s Rule”. The Player’ Rule states that if the hand sums up to anything between 0 and 5 then the Player must draw another card. However, if the hand adds up to a 6 or 7, the Player is forced to stand. The Banker’s rule is more complicated. If the Player does not draw a card, then the Banker follows the Player’s Rule. If the Player draws either a 4 or a 5 then the Banker also draws, but only if they show a value between 0 and 5. The Banker stands if the hand value is 6 or 7. In the case the Player draws an 8, the Banker draws another card if they show a value between 0 and 6, but stands if the hand shows a 7. In the case of the Player drawing an Ace, a 9, a 10 or a Face card, the Banker draws only if their hand totals between 0 and 3, but stands if the hand totals between 4 and 7. Sound complicated enough? It’s actually very easy to get a handle on it after playing a few hands. Either way, the rules are set in stone, and it’s not up to the player—the actual gambler sitting there, I mean—to decide what to do. The cards themselves inform what happens. The hand plays out according to these rules and then the croupier simply announces who won. This is a lot like Roulette in the sense that one sits in front of the table, watches the action unfold, feels the nerves tensing, and then discovers the outcome once it’s announced. The croupier will either say “Player” wins or “Banker” wins. Different casinos have different payout rules, but a generally accepted set of rules states that Player hand wins even money and Banker hand pays 95% to the “Banker” with 5% going to the house. This 5% actually a commission, which gives the casino its edge. 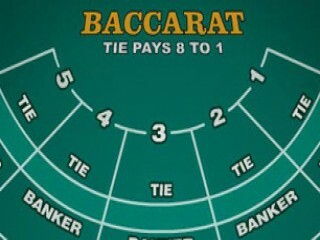 Online Baccarat often offers an even lower house edge, often approaching 1%. In the case of a tie, the croupier says “Egalite’” and the winner is whoever placed the wager on “Tie”. The odds on tie bets are usually 8:1 and the Player and Banker bets roll over to a new game. Punto Banco Baccarat is generally played at an oval shaped table. This is a convention that has been around a long time. There will often be one croupier and two dealers. As in other casino games, croupiers are there to help players play correctly. In most brick and mortar casinos the Baccarat card shoes will hold either 6 or 8 decks. The shoe is passed from player to player, and whoever has the shoe becomes the de-facto dealer and gets to be the “Banker”, though this does not limit the way bets can be placed. It’s merely a custom and a courtesy to call someone at the table the “Banker”. There are versions within versions of Baccarat. And Punto Banco has a variation on the game called Mini-Baccarat. The game is the same, but the amount of players is smaller and the stakes are lower. When they say Mini-Baccarat, they really mean that it’s just a smaller version of its big brother. The thing that sets Mini-Baccarat apart from its traditional version, besides the scale, is the faster pace of each game. Fewer people means less fuss and more play. The odds of Punto Banco are actually very favorable to the player. The casino merely takes a commission on a specific lost bet, and online, the house edge can be as low as 1%. This places Baccarat squarely between Blackjack and Craps, where the best odds in the casino are concerned. This is definitely one of the top three games to play at the casino, if it is offered on low enough stakes to make it accessible in consideration of a specific budget. In France, the mainstream version of Baccarat played is called Chemin de Fer. This is a French phrase that loosely translates as “Iron Road”. Of all the versions of Baccarat, this is the one that’s still played exactly the same as the original game played in the 1400s in the court of King Charles VIII. No one really knows why it’s called Chemin de Fer, but theories are out there and two of the more popular ones are that either the game was originally played with the cards placed inside an iron enclosure, or otherwise it’s a reference to the fact that the shoe (the enclosure) travels around the table, reminiscent of a train. Chemin de Fer is sometimes translated as “Railroad”. Chemin de Fer is governed by strict tradition and the rules are to be respected when sitting at the table. Anyone approaching the table to play will fill seats starting from the one to the right of the croupier, and each additional player takes the next empty seat in counterclockwise order. The dealer will then shuffle the cards and each player is in turn also asked to shuffle the decks. Again, this is done in counterclockwise order. 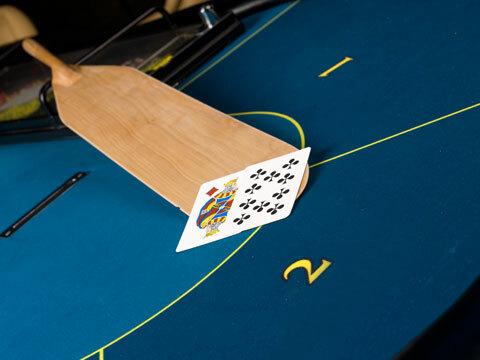 Once everyone has taken a turn to shuffle, the croupier will shuffle the decks one more time before allowing the player to his left to cut the deck. The first player to take the role of Banker will be the player to the right of the croupier (the first player to sit at the table). In this game, the other players are not called Player, but rather, “Punter”. In Chemin de Fer, the Banker announces his bet. Punters are then invited to declare whether they want to make a wager or “go bank”. The wager has to match the entire bank amount. This goes around until someone chooses to go bank or no one wishes to go bank. Only one player can go bank during a game. Once this is settled, then players can place their actual bets—again, clockwise. Once all the wagers are in, the game starts, but if the wagers don’t add up to the bank amount, anyone standing around the table is invited to place a bet until the wagers match the bank. However if the wagers exceed the bank, then the banker can actually increase the bank to match the wagers. This goes back and forth until the wagers and the bank are equal. As you can imagine, the stakes can get very high very fast. The Banker then starts dealing the cards. Two card to himself, and two cards to the player who made the highest wager. Everyone else is a punter, and is represented by the person in play. If either player has a total of 8 or 9, then all the cards are shown. If no one has an 8 or 9, then the player can choose whether or not to draw a third card. If a third card is drawn it is placed on the table face up. Traditionally, if the hand shows either a 6 or 7, the player should refuse the third card. Conversely, if the score is between 0 and 4, then the player should always take a third card. The Banker can decide upon his turn whether or not to draw. When both have taken their turn, the cards are all turned face up in order to calculate the winner of the hand. If the player shows a higher score against the Banker, all the punters who placed a bet win the amount they wagered matched by the bank. At this point the banker role is passed down to the next player down the line. If the Banker wins the hand, then all the wagers are added to the bank and play continues. In the event of a tie, nothing happens and play continues. The Banker can withdraw and collect all the money in the bank—his own original wager plus wagers won placed in the bank. Once a banker has withdrawn, the honor passes to another player at the table. In order to become the banker, a player must place an amount equal to the bank total in the new bank. Play resumes as outlined above. The third and most extreme version of Baccarat is Baccarat Banque. It is very similar to Chemin de Fer, but with one very important difference. The Banker only plays as long as he wins in Chemin de Fer. 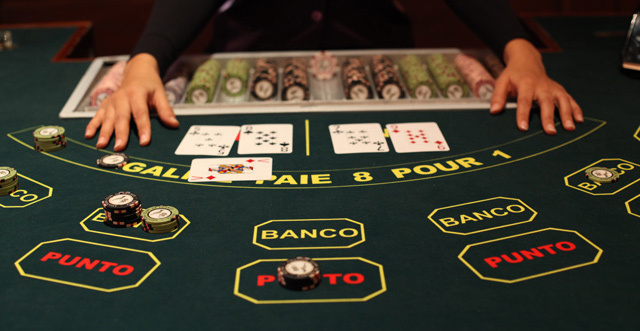 In Baccarat Banque, however, the Banker must remain in place until every card in the deck has been played. There are multiple decks in a shoe, and this can be nerve-wracking on a losing streak unless one has an unlimited bankroll. Unlike Chemin de Fer, in Baccarat Banque the Banker isn’t a turn taken, it is an honor won at auction. This means, that the Banker is the player who has the nerve to risk the largest sum of money. The Banker in Baccarat Banque sits at the center of the table. The punters on either side of the Banker (five on each side) form two separate groups to act in unison against the Banker. Each team has one player to represent the group. The representative remains in play until a winning streak ends, after which, the honor goes to the next player down the line. As in Chemin de Fer, the wagers on the table must match the bank. After the croupier shuffles all the cards and the deck is cut, the wagers are placed on the table. As in Chemin de Fer, player have the option to go bank. If there are two players who wish to go bank (one on each side of the Banker) then they each put in half the amount. When going bank, players can use either one hand or both hands (from either side of the table). If they use both hands, then the wager is divided evenly. Players are not allowed to go bank and lose more than three times. Once the wagers are on the table, the Banker deals one card to each representative, and one to himself. Three additional cards are dealt. This is the same as in the other versions of Baccarat, with the exception being that there are two hands playing against the Banker. The Players and the Banker then take a peek at their cards. In the case of a hand scoring either 8 or 9, the player announces it, and all the hands are revealed. As in Chemin de Fer, tradition states that for a score of 0 to 4, players draw and for a total of 6 or 7, players stand. Then it is the Banker’s turn, governed by the same rules. At this point, all the cards are revealed and the winner is announced. In the event that one of the players’ hands wins against the Banker, he and the players he represented win the amount they wagered matched by the bank. If the Banker’s hand wins, then all the wagers go into the bank after the casino takes a commission. In this version of the game, the Banker can retire only after playing one full hand. After retiring, the Banker announces the amount of money in the bank, and the next Banker must start the game with a matching bank amount and finish out the shoe. Baccarat is a game steeped in tradition and is among the most exciting (and stressful) in the casino. This is merely a guide to explain the rules of the game. In the versions of Baccarat where skill in involved, there are strategies that can give an edge to anyone who knows them. Of course, the standard Punto Banco does not fit this mold, and is a game of pure luck. It is also more fast paced than its European counterparts. If you have the nerve to wager the amounts that Baccarat can demand, online casinos offer the best deals. You can find Baccarat tables at the finest online casinos..